One of my favorite LDS adventure series growing up was Emeralds and Espionage by Lynn Gardner. I was was disappointed when the series was over because it was everything I thought a book should be; action, romance, comedy. And now it was all finished. Imagine my joy when I found out Lynn Gardner had started writing another series. 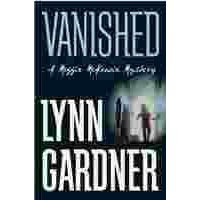 Vanished is the first book in her new series. "There is a saying that everyone has a double. In Maggie McKenzie’s case, the saying is not only true, but the starting point for a troubling—and deadly—mystery. Maggie has just begun her first job as a full-fledged newspaper reporter. It’s a dream come true. But soon the young journalist finds she is captivated by what should be old news—a girl who vanished years ago. Intrigued by what she has heard about the missing girl, Maggie takes advantage of her travels for another assignment to try to solve the mystery of Alyssa Lawson’s disappearance. While on her cross-country quest, Maggie meets psychologist Dr. Flynn Ford, who is interested in helping her solve the puzzle—and in getting to know Maggie better. But as the pair inches closer to the truth, witnesses begin turning up dead. And it appears Maggie and Flynn could be next. Could the woman Maggie thinks might be her sister be trying to kill her?" MY REVIEW: I LOVE this book! Maybe not as suspenseful as the Emeralds and Espionage series, but still kept me wondering the whole time. I love the (sometimes cheesy) romance. I can not wait until I get my hands on the next book!